Everyone loves the fact that DE is totally drug and chemical free! Not only is DE safe to use, bugs cannot become immune to it as they do with chemicals. DE kills insects by scratching off their waxy protective coating causing them to dehydrate. Most insects die in an hour or so. Common uses include: Dust on gardens, flowers, plants, bushes and trees • Apply a 2-inch border around foundation of the house • Sprinkle in and around animal and pet housing • Pour on and down ant hills (including fire ants) • Spread over large areas with a fertilizer spreader or duster • Sprinkle in carpet, furniture, mattresses, etc to kill infestations • Mix with water and spray or whitewash infested areas • Add to stored grain or foodstuffs • Apply in studding during construction to create a permanent bug guard. Hundreds of reports exist on how DE takes care of fleas, ticks, mites, etc on the animal’s outside, and worms and parasites on their inside. This is exciting because DE is non-drug and non-chemical. Common uses include: Dust on the coats of dogs and cats for flea, tick and lice control • Add to food each day for worm and parasite control • Add to food for joint, skin, and hair coat health • Add to feed to kill fly larva in manure • Use on birds/poultry for lice and mite control • Apply to moist kennel areas for pest and odor control. Many people take food grade DE every day. You might ask, How can something that kills bugs be good for people? Remember, DE kills bugs by scratching them—no chemicals are involved. For people, DE is a source of available silica. Silica is a major mineral we all need that is lacking in our foodstuffs today. A general recommendation: 1 tablespoon of DE per day in juice, water, applesauce, yogurt, protein shake or liquid of choice. Hundreds of feedback testimonials! This is what people are saying: • Sore joints feel better • Lowers cholesterol levels (usually 50-75 points lower) • Lowers blood pressure levels • Stabilizes blood sugar levels • More energy • Healthier skin–softer, less itching, faster healing, psoriasis gone • Stronger and healthier nails and hair • Calms nerves and better sleep • Aids in weight loss • Detoxifies • Cleanses digestive tract of parasites. Magnified thousands of times, Diatomaceous Earth looks like a cylindrical version of Wheat Chex Cereal. These powdered microsopic shells of ancient freshwater plants called diatoms have strong negative charges. As these millions of ground up powdered silica shells move through the stomach and digestive tract, they attract and absorb bacteria, viruses, fungi, protozoa, pesticides, endotoxins, drug residues, heavy metals and E-Coli. These are trapped inside the cylinder and passed out of the body. Also, any larger parasites that happen to be in the digestive tract are “cut up” and killed by the sharp edges of the Diatomaceous Earth. All of this results in a far more healthy body with less ilness and infirmity. 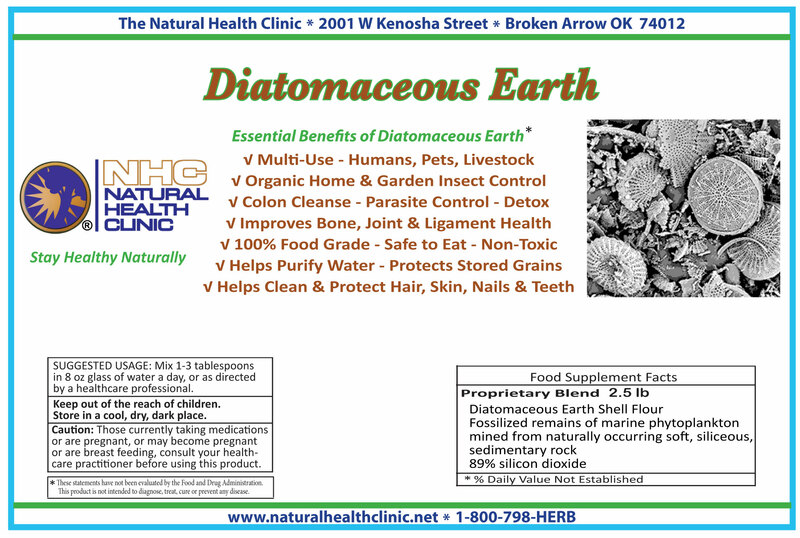 Folks often say that “I just feel better” with one or two teaspoons a day of Diatomaceous Earth in their favorite juice or liquid. This feeling of well-being comes from all of the “junk” being removed from the body and because the immune system has now received the “jump start” that it needed.